Hello and welcome to the 27th Accessories to Murder! Are you ready to delve into the world of amazing accessories? Excellent. Without further ado, here are the accessories that have made it onto this week’s She and Hem’s Most Wanted. Considering my Mother has been raving about Radley for as long as I can remember, it’s a surprise that it’s taken me this long to jump on the bandwagon. But consider me a fully fledged fan thanks to their adorable Lido range which is so delightful (apart from the pricetag, naturally). I’m also slightly obsessed with their yellow and white backpack of dreams! Ol’ Queenie is turning 90 this month and I can’t think of a more fitting way to celebrate than by drying my teacups with this tea towel from Cath Kidston. I think Liz would totally approve. I really can’t get over the corgies wearing party hats and blowing their party horns. GENIUS. There’s also a mug and tote bag available if you really want to party hard! How lovely are these pink polka dot sunglasses from Topshop? They are so cute! I mean, I need another pair like I need a hole in the head but still, so cute! Who doesn’t love a fun sock? Weird people, that’s who. This ice cream festooned pair from Accessorize are surely bound to raise a smile. My bank balance is having a darn good chortle at the very idea that I might ever be able to buy this insane Kate Spade teapot bag but corr blimey it’s a bit special. Thankfully, the rather lovely tea time studs are more budget friendly and, umm, will take up less space in my flat? That’s the silver lining I’m going with anyway. Spotted any fab accessories? Let us know! Hello and welcome to the 23rd Accessories to Murder! Are you ready to delve into the world of amazing accessories? Excellent! Without further ado, here are the accessories that have made it onto this week’s She and Hem’s Most Wanted. Pretend everyday is your birthday with this Bow Box Bag from ASOS. It’s cute, sparkly and has a massive bow. What’s not to love? I feel like I can’t move onto the next item without also mentioning those incredible pink bow heels. Now I can’t seem to find them online, but I have found a silver version here, which are just as special. Bow fans, you are very welcome. Running with the novelty bag theme for a moment, next up we have this Shell Clutch Bag, chosen especially for all of our mermaid readers. Believe me, I’ve checked the stats and those mermaids love to keep a keen eye on our Most Wanted. This clutch is such a beaut that I’d be more than happy to shell out a few clams for it. If it’s not for you, then get the shell out of here! All of my sugary dreams have come true because some absolute genius has created a Poptart Phone Case. Here’s hoping it’s the start of a whole Poptart range. I want to see Poptart pyjamas, Poptart bikinis and Poptart pants. If any of these things already exist, let me know, yeah? Although this purse is more Popsicle than Poptart, it’s definitely just as tasty. Kate Spade is full of gorgeous items at the moment, but I thought I’d give you the scoop on this ice cream dream. The fun and colourful print also comes in other flavours, with a sleek and slim card wallet also available. Treat yourself and get them both. Accessorize seem to be going out of their way to ensure I’ve saved up no pennies for my upcoming holiday. First up I just HAD to buy the Robot Bag, followed by the awesome Radio Bag, and now they go and release the twee as you like Picnic Basket Bag. I’m an utter basket case for gingham. Top Tip, if you can find a store with any Robot Bags left, they are now measly FIVE POUNDS! To be honest, I’ve not completely made up my mind about these Cheshire Cat Pumps, part of the Alice in Wonderland collaboration between Irregular Choice and Office. They are so fun, look super comfortable with that cute small heel, and c’mon the have a big smiling cat on for goodness sake. I’m just not sure where I would wear them, yet I am strangely captivated by them. I think the price is also a little off putting, but I’m sure I will be ALL over them if they get reduced. Let me know what you think of this weeks items, and keep accessorizing! Hello again and welcome to the 19th Accessories to Murder! Regular readers may have noticed that Accessories to Murder is now back on track, and you’ll have a lovely new post ready for you every Sunday. So pop it into your diary, or if you are just far too modern and fancy for a pen and paper, follow us on Bloglovin and never miss a post! So, are you ready to delve into the world of amazing accessories? Excellent! Without further ado, here are the accessories that have made it onto this week’s She and Hem’s Most Wanted. Tired of wearing your heart on your sleeve? Well, wear it on your feet instead with these ASOS heart flats. Just in time for your Valentine’s Day outfit too! I’m thinking full on hearts this year, so these loooverly shoes are the perfect finishing touch to my hella twee look. Simple but just quirky enough to make it through the tough Accessories to Murder selection process. If those flats aren’t quite right for you, here’s another adorable option. This cute pair in ‘Poppy Red’ from Boden are blooming beautiful. We recently featured them on our Instagram and they got oh so much love. They have a pretty bow detail and are flat enough for the walk home after you’ve been wined and dined on Valentine’s Day…or for my walk to kitchen to get just one last biscuit. I hadn’t really considered Modcloth when buying swimwear until about a year ago, when I spotted one of their incredible swimsuits online. I added this to my Pinterest ‘Wish List‘, causing a internet sensation mild murmuring, and the cossie to be repinned here, there and everywhere! I’ve kept a keen eye on their swimwear ever since, and it is always fun, flattering and fabulous. This swimsuit from Modcloth features cute cats and cupcakes floating around in space. Cats. In. Space. What else could you possibly want? I am a huge fan of all things Skinnydip, so I was pretty hyped when Jo sent me a link to this beauty. I predict the sales of this Skinnydip cactus bag, and matching luggage tag, are due to spike sometime soon, so hurry up and get your hands on this super succulent! Don’t put your hands on a real cactus, that would hurt and leave you feeling awful prickly. This gorgeous Betsey Johnson bag might just be my perfect Valentine’s present right here. Can someone please point it in the direction of my husband? I’ve become quite the Betsey Johnson fan after featuring the incredible working phone in the recent January Sales post. I had so many messages from readers who loved the phone bag, hopefully this one will be just as popular. You may not be able to make calls with it, but it does have a really sparkly bow, so y’know, every cloud. Yes, I know this is slightly more expensive than our usual Most Wanted novelty bags, but I’ve found it here via Nordstrom for much less than if buying direct from the Kate Spade website. How kind am I? Kate Spade has always been a high flyer in the world of whimsical clutch design, and my love for this kite bag is going up, up and away! I really recommend that everyone has at least one staple yellow handbag in their wardrobe. I use my yellow Boden Westminster handbag every single day and I absolutely love the pop of colour it adds to any outfit. New Look have just released this tote, their very own sunshiny dream, for a very affordable £24.99! Stacked pancake socks.Sometimes, a picture really does say a thousand words. So instead of raving about these, I shall just give you my top stock sock tip. If I was going for the famous ‘3 for £8’ Topshop sock deal, I would also pick the Coffee and Donuts and I Loaf You pairs. Why? Because they are awesome. The red carpet has been rolled out in Bristol this week for the return of the South West’s largest fashion event, Bristol Fashion Week at The Mall. Thousands of stylish Bristolians will be strutting over to The Mall to catch one of the 17 catwalk shows, hosted by Lucy Watson from Made in Chelsea and Lorraine Kelly’s BFF/TV stylist Mark Heyes. This year the show has a travel theme, with the entrance of the purpose built pavilion styled as an airport departure lounge and each store has put together a cool collection of on-trend looks, based on gap years, summer holidays and safari chic. We flew in on Wednesday night and, in true She and Hem style, were the last to board flight S/S15, with a one way ticket to the land of denim, swish 70’s and our personal favourite, brights. We saw so many outfits, the Bristol Fashion Week tailor must be swift. His career will certainly take off! After the show, we had a stop over at M&S in The Mall to check out the new Limited Edition collection, hang out with lovely local bloggers and eat ALL of the cheese. I (Victoria) fell in love with the Paisley Print Dress that Lily is beautifully modelling below and Jo’s yellow M&S Limited Edition No Peep Dress was certainly first class! In addition to her gorgeous M&S dress, Jo wore brown beads (old) also from M&S, spotty tights from UK Tights, Urban Outfitters boots and her Kate Spade bag. I wore a vintage 1970’s dress from Portobello Road with my brown Orla Kiely for Clarks heels and black tights from UK Tights. My belt is from New Look and black floppy hat from ASOS. We both accessoried with M&S flowers! Will we be seeing you at Bristol Fashion Week 2016? We started off Day 2 of LFW with a trip to the Orla Kiely showcase (which we have written a post about here!). After that, we had some time to kill between shows, so we decided to go and check out the ever fabulous Somerset House. Pretty standard London Fashion Week activities I’m sure you will agree. What we are not so accustomed to is how we traveled there… in a stretch hummer! The lovely Kristabel from I Want You To Know captured this in her awesome Fashion Week Vlog. Be warned, the vlog does feature me (Victoria) getting a little over excited and doing what the kids are now calling #hummerdance. I wore the Square Print Pleat Skirt Dress from The Whitepepper with probably the most worn item in my wardrobe ever, my yellow Ingrid Coat from Boden* (now in the sale!). I accessorised with fun spotty tights from UK Tights*, white ASOS Strike Heels and a yellow Westminster bag from Boden*. Jo wore a gorgeous Needle and Thread tulle skirt from ASOS, with a vintage blue jacket from Heartfelt Vintage and floral Emilie top from Boden*. Her Alice Heels are also from Boden and that glorious pink bag is Kate Spade. Our jazzy outfits proved to be quite the hit on the cobbles, and we ended up popping up all over the place. Some of our favourite features we saw over the weekend were Yahoo’s best street style, ASOS Fashion Finder, STYLELDN and Boden Diaries. We had such a blast that we often struggled to pull our best ‘we are very serious about fashion’ faces. We had quite a busy schedule that afternoon, but our favourite show was the couture collection from Hellavagirl. The show was a kaleidoscopic dream! Vibrant, dramatic and seriously sparkly. Just look at those incredible giant sequin bow headbands! Hellavagirl designer Helen with the models. Having been up since 7am and in need of a pick me up, we made use of our central location and decided to head back to base for a quick G&T and get changed into our chirpy Poppy frocks before heading out to our evening shows. Lady Gaga would be proud! I wore the Iris Navy Budgie Dress and Jo wore the Mable White Budgie Dress. Keep your eyes peeled and your beaks sharpened for a new Poppy post next week. London Fashion Week AW15: Day 3 coming next week, you lucky things! Hot air balloon prints are basically my thing (our first ever post was about balloon prints fact fans!) so when I noticed that Kate Spade has brought out an entire collection of balloon inspired wears my credit card spontaneously combust out of fear. I mean, just look at this bag! It’s all so perfect. Now, I wouldn’t normally include something so high end on a Double Thumbs roundup but this list is supposed to reflect the dresses that I am lusting over and oh boy do I want to float around the world in this vintage inspired shirt dress. Get in my (wicker) basket, etc etc. But hey, the sky is still obtainable even without my balloon thanks to Cath Kidston and their gorgeous new cloud print. This is possibly one of my favourites ever of theirs thanks to that beautiful shade of blue. It’s such a fresh print and, as always, the perfect shape too. Hot on it’s heels at the top of my CK wishlist is this fab Ric Rac print dress. How fab are those colours? So bright and fun! It reminds me of a maypole and makes me want to go to country fetes and wear a straw boater. I basically just need this dress. Boden have also brought out some absolutely cracking dresses this season because it would appear nobody wants me to have any money anymore. Cheers, guys. Anyhoo, this fruity frock has pipped the others to the post as my favourite and is most definitely the apple of my eye (sorry). I really love the orange and the pink print but it does also come in blue too if that hue just isn’t for you. This lovely floral midi dress from Seasalt has been styled on a vintage tea dress. It’s ever so pretty and I love the print and all the button detailing. We have actually featured this gorgeous envelope print from Emily and Fin before when they originally debuted it in navy blue last year. It is now back in a fresh new colour for 2015 and would make the perfect Valentine’s frock. Who needs a card when you’ve got 450 beautiful envelopes, eh? I also fall in love with the Orla Kiely for People Tree collections and this season is no exception. For Spring this year they have gone classic Orla with retro 50s inspired pieces in beautiful shades of pink, grey and green. I think this sleeveless number is my current front runner. We finish off in true twirly style with this pink polka dot number from Joules. I do love a good floaty fock and this ticks all the right 50s boxes for me. Gorgeous! Good morning one and all and congratulations, you’ve made it to Wednesday! Why not reward yourself with a cursory glance at this week’s list of dresses that receive the highly coveted She and Hem Double Thumbs seal of approval. It would almost be rude not to. This looks like a lovely wintery dress doesn’t it? I can imagine doing all manner of pretty wintery activities wearing this number. It would most probably be totally impractical to go ice-skating in but gosh darn it, you’d look nice wouldn’t you? Until you fall over that is. Lovely stuff, River Island, lovely stuff. I love this very pretty navy dress from Zara. 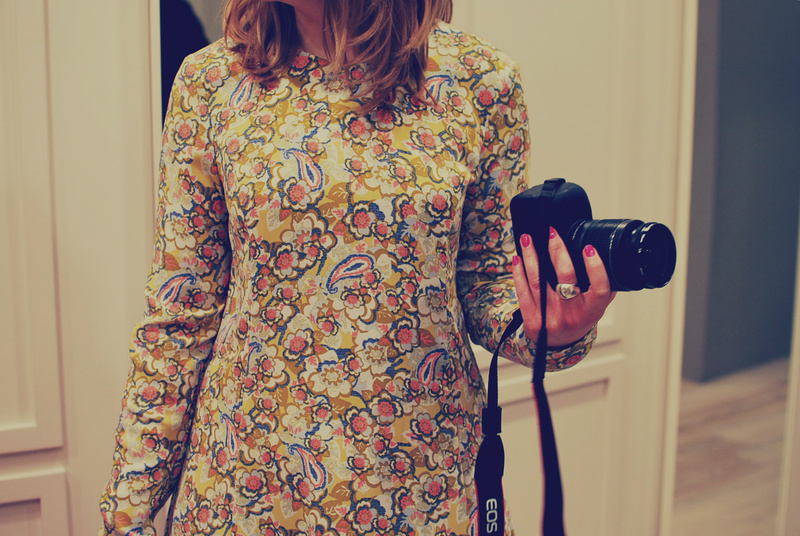 The floral print is all sorts of lovely and I find that shape and style of dress to be extremely flattering. The cut out detail on the back makes it stand out from all the other millions of floral dresses I love and, thus, gives me the perfect excuse to buy it. Well played. When it comes to modern vintage, Boden are just superb. I simply love this 60s inspired Aubrey dress from their new collection. Giant polka-dots for the win! The good news is Boden have kindly knocked 30% off the price of dresses (at the time of writing that is), the bad news is you might have a job on your hands obtaining your size.